Happy new year to those of you who celebrate Rosh Hashanah. L’Shanah Tovah! Last night, we sat around our beat up kitchen table, the same one Steve and I had in our tiny NYC apartment, now marked by over a decade of scribbles and tasty spills, and ate this tender brisket. It was our usual chaos, with the kids all trying to tell us about their day at the same time while Sophie clamored to be fed, and instead of a big feast, I only served one dish: this sweet and spicy slow cooked brisket. We dipped Michigan apples into raw honey and tore into a round Challah lovingly baked and shipped by grandma Mimi in New Jersey. There was no apple cake or other traditional dishes, but it was a special celebration, one to remember, the first holiday celebrated with Baby Sophie. The brisket was a wonderful, sweet yet subtly spicy dish to awaken your taste buds and bring in a sweet new year. And for those of you who are just celebrating the first full week of fall, this dish is also one to bookmark as it’s the perfect weeknight supper to simmer in your slow cooker on a blustery and windy day. My brisket is adapted from Smitten Kitchen‘s brisket recipe who in turn adapted Emeril Lagasse‘s recipe. Now you just need to tweak it to make it your own. Summary: I adapted this brisket recipe from Smitten Kitchen who in turn adapted it from Emeril Lagasse. Now it’s your turn to make it your own. In a large Dutch oven, pour the olive oil and heat on medium heat. Brown the brisket on both sides, approximately 5 minutes on each side. Remove from pan and set aside. Add the onions and garlic to the Dutch oven, do NOT remove the brisket grease and remaining olive oil. Saute until soft and translucent, 5-7 minutes. Add the carrots, spices, ketchup, brown sugar, stock, beer, chili sauce and stir well. Cook for another 2 minutes, to bind the flavors together. If you are cooking the brisket in the slow cooker, now is the time to transfer everything to it. First place the brisket on the bottom and pour the sauce on top. Cook on high setting for 3-5 hours, flipping it every 30 minutes or so. If you are not cooking it in the slow cooker, put the brisket back in your Dutch oven and flip it a couple of times to mix well with the sauce. Cover and cook on low heat for 3-5 hours, flipping it every 30 minutes or so. Brisket should be fall apart tender when ready to eat. Slice it carefully into 1 inch wide pieces. 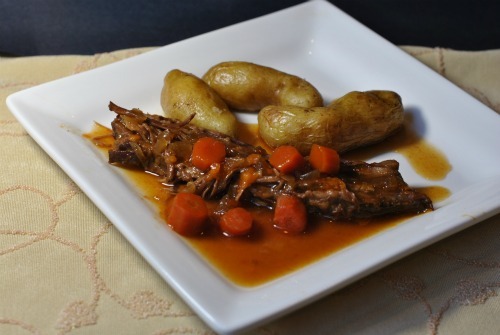 Serve piping hot with some oven baked fingerling potatoes and plenty of sauce and bright carrots. Enjoy! I’m feeling cozier just looking at that. I LOVE brisket. There is something about the fall apart meat that makes me just want to put on some fuzzy slippers and curl up in a big chair. Kelly, I love your comment! It made me want to curl up in a big chair with fuzzy slippers. What a great image! I have to admit that I love fall, even in Chicago when it is so brief and followed by such a brutal winter. I just love the drama of all the colors! This sounds tasty. We’ll have to try it after we are settled in the house. I think the only seasoning my mom uses on her brisket is salt. No kidding. My husband and I use a mixture of OJ and Manischevitz wtih a little salt and ketchup thrown in. (Really it’s good, if a bit sweet.) And we load up our roasting pan with tons of root veggies and mushroom.